The Dog Pen: This beautiful and functional accessory not only looks great in your barn colors, but it also solves a safety issue. No more worrying about your dog getting loose on the show grounds. You can go about your day knowing your best friend is safe and comfortable. Functional enclosure drapes allow you to make the tent very cozy. 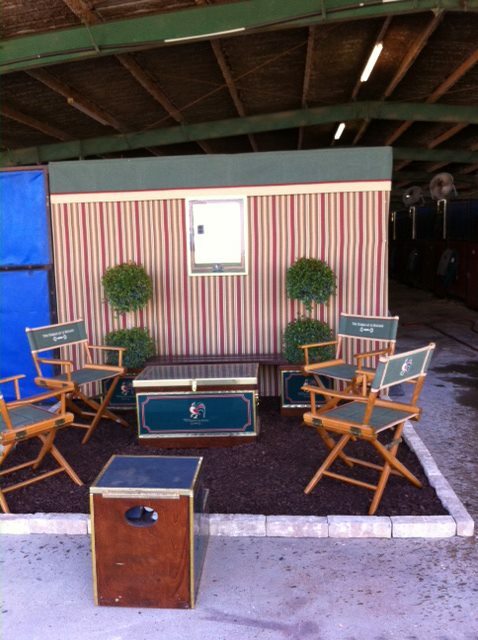 The paddock is made of panels so you can expand it to the perfect size for your best friend(s). 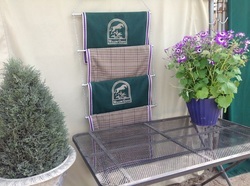 An optional mesh cover is available for the paddock to keep dogs with springs on their feet safely where they belong. We offer chair frames from Telescope. Recognized as the best in the business, these warrantied chairs come in clear, walnut, white or black. Heights are dining height, bar height, or child height. Our seats and backs are constructed with Sunbrella fabric, padding and seats have a heavy vinyl bottom. Cushy is the word most used to describe the feel. Three colors, of course, and your embroidery on this item is complimentary. Shipping bags available. Staying organized at a show is half the battle. Our custom, three color bandage holders help you accomplish this goal. 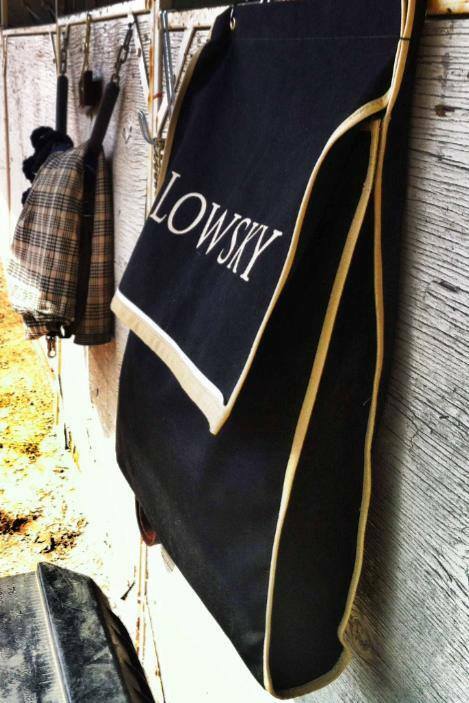 Constructed from Sunbrella and fully embroiderable, they are a perfect solution to keep your barn neat and tidy. Constructed from Sunbrella Fabric and available in three colors, our stall guards are portable, light and durable. They are easily embroidered with logos or names. Changing screens allow privacy for changing without needing to close the zipper door on the dressing room. They also project a neat appearance even if the dressing room isn't so tidy (teenagers). Our frames are light weight and portable and come with a padded shipping bag. The covers can be constructed in a single color or each side can be different so you can change the look. Contrasting welting is an option as is a built in valance. We are happy to embroider your logo on the front if you'd like. Our table covers are available in a variety of sizes and shapes. You can choose a contrasting welting or embroidery if you'd like. With this option, you can turn an inexpensive, portable table into a functional piece of furniture to display your colors. Add coolerettes to your set up as another way to display your colors and logo. We can construct coolerettes out of wool, sunbrella, or we can cut down award coolers and retrim them to your specifications.